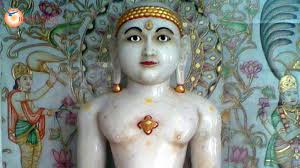 Paryushan Parva, the monarch of all Jain festivals, is celebrated by spiritual seekers around the world to experience deep connection, devotion, inner-cleansing and great spiritual elevation. 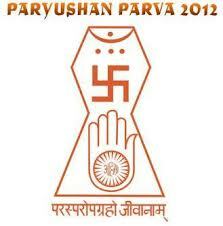 Parvadhiraj Paryushana, this festival has the highest power of doing auspicious to the worshippers. This festival takes the soul to the upper condition. It lights the lamps of life i.e. pious life. This festival also shows the path of salvation. 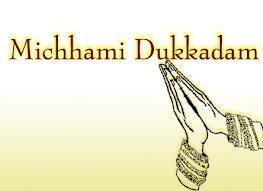 It is compared with water works through which one can clean one's soul from the dirt of Karmas. This also makes the sinful persons pious and virtues. The souls which are already aware about the merits and sins, can do their duties, but those people who are still passionate towards worldly pleasures become aware of new motivation. So this festival is celebrated. Besides assuring a blissful existence in this world and the other world for every living being, it aims at the attainment of salvation - the supreme ideal for mundane soul. 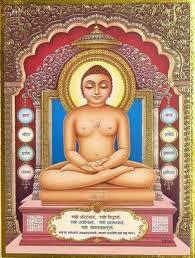 The non-Jains also express high reverence for this Jain festival. 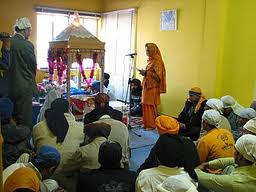 All members of Jain community- high and low, young and old, and males and females, participate with full vigor and zeal in the various religious rituals and cultural programs. 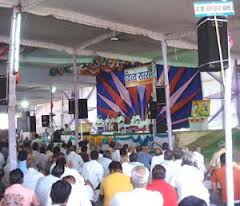 They listen with rapt attention to the holysermons of the saints and learned Jain scholars arranged during the ten-day festival. 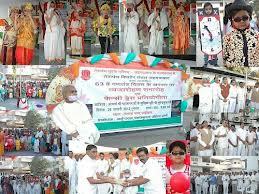 In these celebrations lie dormant the seeds of the well being, peace and happiness of the common man. 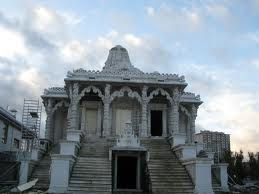 On the eve of this festival all activities, which add to social discord or bitterness are declared taboo from the temple pulpits. 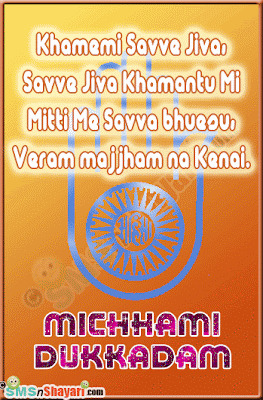 These celebrations harbinger social harmony and amity and preach the lofty Jain motto ‘Live and Let live’. Parva Raj - The festival which carries a special and greater significance; its celebrations spread over a longer duration and it is more soul-stirring than any other Jain festival. 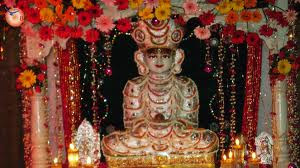 Maha Parva - It is an ancient and chief of all Jain festival. 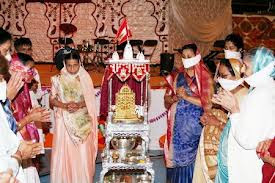 Dash Lakshan Parva - The festival is the observance of ten universal virtues; viz., forgiveness, contentment, and celibacy, which aim at the uplift of the soul and are vividly preached and practiced during the festival. Paryushan Parva - The festival through which an attempt is made to put an end to all vices, passions and lustful desires in thought, speech and deeds. Paryu-Prasa - The festival in which one meditates upon the inherent virtues of the soul in thought, speech and action; or one attains peace of soul i.e., celestial peace. Paryupshamn or Pajjusvana - The festival in which an attempt is made to obtain peace discarding all passionsand lustful desires through various means; and observe harmony in the soul through the study of scriptures. 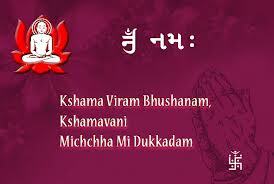 Pajjushana - This word of Prakrit language carries the same meaning as explained in Paryushan Parva. 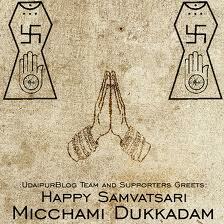 Samvatsari Parva - The festival which is celebrated annually to subdue all passions and lustful desires. 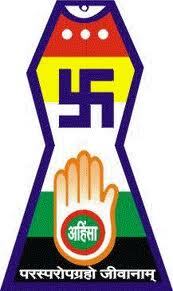 This title is popular to the Swaitamber sect of Jainism. 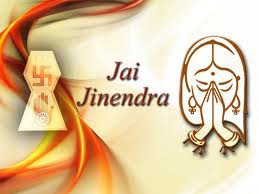 In Jainisim, fasting is considered as a spiritual activity, that purify our souls, improve morality, spiritual power, increase knowledge and strengthen relationships. The purpose is to purify our souls by staying closer to our own souls, looking at our faults and asking for forgiveness for the mistakes and taking vows to minimize our faults. Also a time when Jains will review their action towards their animals, environment and every kind of soul. Tu Mane Bhagwan Ek Vardan Api De.